Ex-Jazz center will get a reported $41 million over three years. 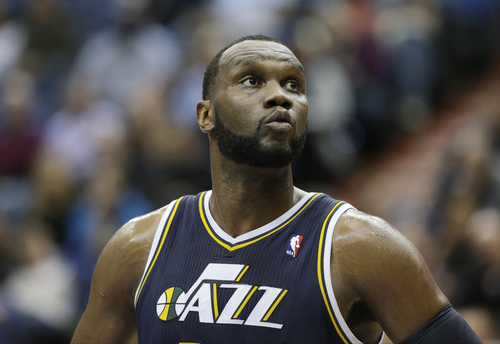 Al Jefferson agreed to a multiyear contract with the Charlotte Bobcats on Thursday, bringing an end to the genial center&apos;s three-year tenure with the Utah Jazz. Acquired in 2010 as the next link in a chain of quality big men that included Karl Malone and Carlos Boozer, Jefferson&apos;s run in Salt Lake City was marked by great unrest, the departures of Jerry Sloan and Deron Williams, as well as hope thanks to the arrivals of Derrick Favors and Enes Kanter. In the end, however, relentless liabilities on defense, a high price tag and the emergence of the very players he so ably mentored spelled the end for Jefferson. His contract with the Bobcats, which cannot be signed until July 10, is for a reported $41 million over three years, with a player option the third year. In Charlotte, Jefferson will be relied on as the primary post scoring option. He became the first of the seven Jazz free agents to agree to a contract and did so with the only team with which he was linked in the media. The Jazz have nearly $30 million in cap space, but have been patient. The franchise&apos;s inactiveness reinforces the belief that it is content to build around Favors, Kanter, Gordon Hayward and rookie point guard Trey Burke, for whom general manager Dennis Lindsey executed a draft-day trade to acquire. Jefferson, 28, was the Jazz&apos;s leading scorer and rebounder each of his three seasons in Utah. Last year, he averaged 17.8 points and 9.2 rebounds, leading the Jazz to a 43-39 record. However, the team missed the playoffs for the second time in three years, a far cry from the winning scenario he thought he was stepping into when he arrived in Utah from Minnesota. "I felt with the cards that we was dealt, we played them well," Jefferson said during locker cleanout in April. "We played them very well. With a young team, half of the team was young, half of the team was veteran and we came in and mixed well together." The Prentiss, Miss., native was the mayor of the Jazz locker room, mentoring younger players, most notably Kanter. The player he affectionately called "Big Turk" began emulating his moves; some of them, Jefferson said, the young center did better than he did. All along, Jefferson dismissed the notion that he was grooming his own replacement. "That&apos;s the way you looking at it," he once told a reporter. "I&apos;m looking at it as helping another young fella out, improve his game. Hopefully when he becomes a vet, he&apos;ll do the same with another young guy. ... Somebody did it for me. Want him to do it with somebody else." Jefferson was named the Western Conference player of the week in March, but never became an All-Star, something Williams told him would happen when the two were first paired together. They played just 57 games, however, before Williams was traded for a package that included Favors, Devin Harris and the draft pick that turned into Kanter. While Jefferson was steady, the team around him never was. Each of his three seasons the Jazz had a different starting point guard, from Deron Williams to Harris to Mo Williams. Asked in April if it was emotional to be leaving a Jazz team that made him the face of the franchise, Jefferson took a business-like stance. "We hope we&apos;ll all be in the league next year," he said. "When we&apos;re not in the league next year, that&apos;s when everybody be crying, trying to figure out what&apos;s going on. We might be on different teams, but having this job is always the blessing, as long as you be somewhere in this league."